Vitiligo is a medical condition that causes the skin to lose color. Some people develop a few spots that lighten or turn completely white. Others have more widespread color loss. It can develop on any part of the body. Sometimes, it also causes a patch of hair to turn white. Skin color may return on its own. For some people, however, the color loss can be permanent if not treated. People of all races get vitiligo. About half develop vitiligo by age 20. Nearly 95% develop vitiligo by age 40. Research shows that about 20% of people living with vitiligo have a blood relative who has vitiligo. It develops when cells called melanocytes die. These cells give color to the skin and hair. Scientists do not completely understand why these cells die. We know that it is not contagious. 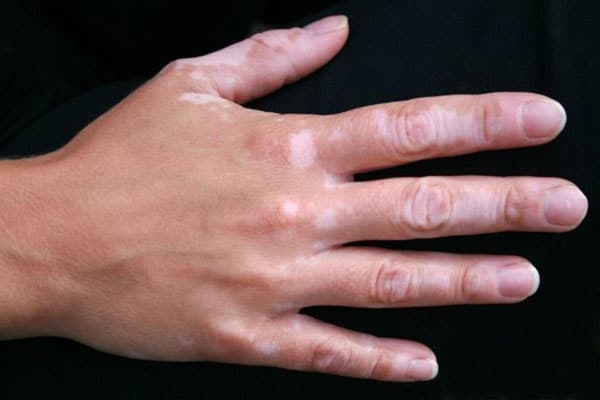 The most common type of vitiligo, generalized vitiligo, may be an autoimmune disease. An autoimmune disease develops when the body mistakes melanocytes as foreigners, the immune system begins to attack and kill these cells. A dermatologist diagnoses vitiligo by examining the patient’s medical history and skin. Medical tests are sometimes necessary. The dermatologist may remove a small amount of the affected skin. This is called a skin biopsy and the skin is numbed before this quick and easy procedure. If the diagnosis is vitiligo, blood tests may be recommended to look for other autoimmune disorders. This is the most common type. The skin usually loses color equally on both sides of the body. Color loss can affect the arms and legs, including the hands, fingertips, and feet and also around the eyes or mouth. In the beginning, color loss may be rapid. This is often followed by a period of little or no color loss. 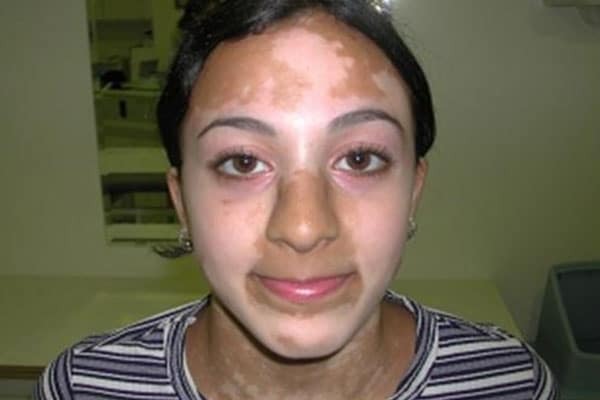 Also called segmental vitiligo, this type causes color loss on one part, or segment, of the skin. Hair color also may be lost in the involved area. Often, a bit of hair on the head, an eyelash, or eyebrow turns white. Color loss often occurs for a year or two, and then stops. Color loss occurs only on the head, hands, and feet. Color loss occurs on most of the body.. This works slowly. One type, narrowband ultraviolet B (NB-UVB), requires two to three treatment sessions per week for several months. Patients may receive NB-UVB therapy by standing in a light box a few times per week or by getting localized laser treatments. NB-UVB works best on the face and trunk. The hands and feet seem the least likely to respond. These topical medicines are applied at home as directed. Medicines that a dermatologist may prescribe include a topical corticosteroid or calcipotrial. Like light therapy, topical medications work slowly to return color to the skin. To return color to the skin more quickly, a dermatologist may combine treatments. For example, a dermatologist may prescribe both a topical corticosteroid and calcipotriol. For patients undergoing NV-UVB light therapy, a dermatologist also may prescribe a topical therapy to be used at home. Patients who apply these creams and ointments must be carefully monitored. Be sure to keep all of your appointments. Everyone who has vitiligo can benefit from sun protection. Skin that has lost color sunburns very easily. A sunburn can make vitiligo worse. For people who have pale skin, avoiding a tan often makes vitiligo less noticeable. This can eliminate the need for treatment. For sunscreen to protect your skin, it needs to be applied 20 minutes before going outside and reapplied every two hours.